Total Fitness DVDs should be your first stop if you are looking for fitness DVDs online. They have over 1200 to choose from! I like that they do have so much selection and this a store that will appeal to everyone no matter what your preferences or fitness levels. You can search by workout, brand and instructor. I am most interested in the Yoga and Pilates workouts. The Tai Chi DVDs are also ones I would like to try out. You can seriously spend a lot of time just browsing all the DVDs and making your “wish lists”! 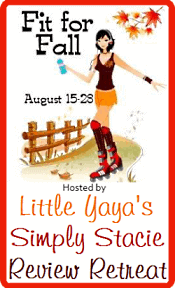 I received Anchor Bay’s Healing Yoga for Common Conditions DVD for my review. I selected this particular one because it is designed to be more gentle and good for people chronic injuries and illnesses. It works to help you increase your metabolism as you gently stretch your muscles and relieve your stress. On the cover it says its beneficial for people with high cholesterol, diabetes, weight issues, and poor circulation. I have none of these, but I do have chronic pelvic pain and my muscles are always under tension and stress especially in my lower half. Some days my legs feel like they are on fire because they are so tense. Yoga is one of my favourite types of exercise. I like how it is gentle and helps me to relax. This DVD is perfect for beginners like me. I like that it is a slow pace and lots of stretching. I can feel the benefits in both my mind and body. Charles and Lisa Matkin, yoga professionals, take turns in doing the poses and explain thoroughly each move and how it will help your body. They also show you how to breathe which is essential in yoga and part of the program. The DVD is 35 minutes long so its a quick workout that I was able to sneak in a few times a week. I think I would benefit by doing each day and especially in the morning to get me all stretched and loose for the rest of the day. 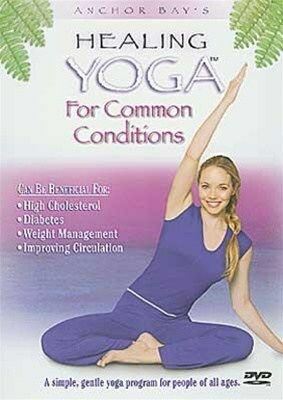 You can find Healing Yoga for Common Conditions on Total Fitness DVDS for $7.99. Very affordable! Check out all the titles on Total Fitness DVDs and find a workout that’s right for you. Just wanted to say, I’ve got the bollywood boogie and it’s great fun. Well worth getting. I’d love the Pilates dvd! Kettlebells the Iron Core Way Volume 1 & 2 DVD. Well, I can’t tell if the one I want is a single DVD or what! I would love the Lauren Brooks Kettlebell Workshop with Z-Health DVD, but if that’s not available, I’d like the Xtreme Strength Circuit on the Ball DVD w/ Gin Miller.